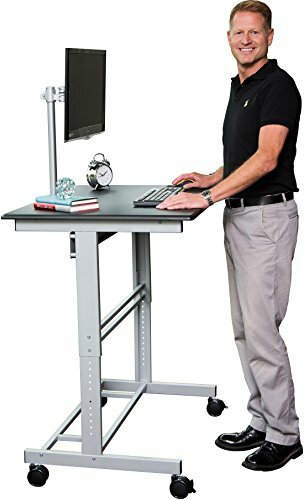 Standing desks have become a recent technological advantage for those people required to sit for long periods of time. With their ergonomic construction, a standing desk is scientifically designed to provide more comfort than a traditional sit down model. 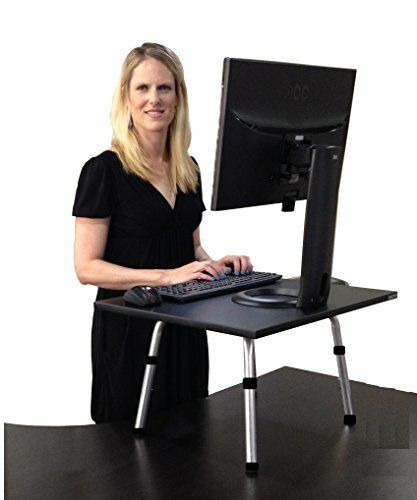 Having a desk that allows the user the ability to move around and stretch their muscles while still being able to work on their computer, has proven to increase their overall wellbeing. Those who sit sedentary throughout the day have an increased risk of obesity, diabetes and heart disease. A standing desk offers many benefits, such as allowing you a change from the sitting position, increasing blood circulation and decreasing potential health threats. Studies have shown that certain standing poses minimize stress leaving the body feeling refreshed, ultimately motivating the mind and body to be more productive. 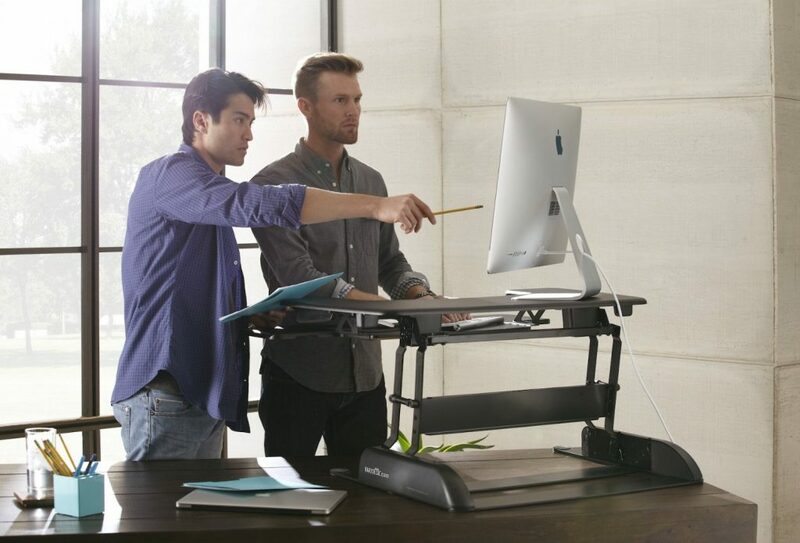 Here are 10 of the best standing desks worth giving a try. Stand, stretch or dance while you work with one of the first standing desk designs. Retailer Stand Steady constructed this durable desk that can hold up to 75 pounds. The neutral flat tabletop, available in three colors will compliment any office furniture as it holds a monitor, keyboard and mouse. The simple, streamlined design allows for easy transport, so it can be placed anywhere you want to stand. Sleek, metal adjustable legs allow the desk to be positioned to the most comfortable height. This 32-inch tabletop will effortlessly turn your existing desk into a more comfortable work station. With extra surface space you can have room for much more than just a keyboard and monitor. Metal legs have six different adjustment settings to position the height. The thin legs take up little room, so there is plenty of space on the original desk for additional items or when you chose to sit and work. 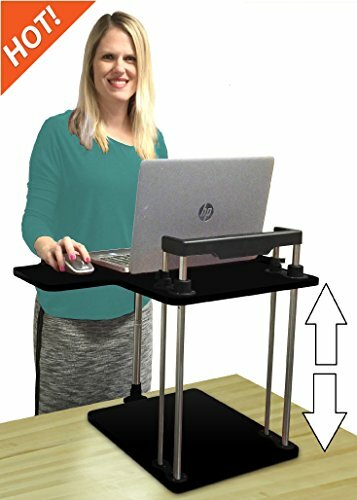 Rubber caps on the bottom of the legs allow the standing desk to stay securely in place without scratching the lower surface. The Stand Up Desk Store offers a spacious 40-inch adjustable height desk in a sleek walnut color. An exciting feature includes a mount for your 24-inch monitor with a tilt and swivel option. 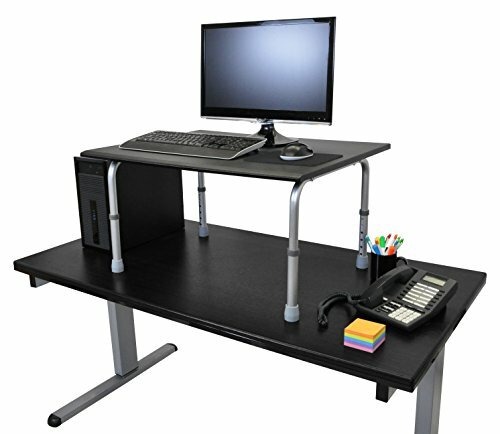 Rolling wheels allow the desk to be transferred and positioned in the most convenient space. The silver metal frame can be adjusted to the perfect height within one-inch increments. Heavy-duty screws firmly hold the frame in place for a secure fit. There is some assembly required, however with included detailed instructions your standing desk with be together in no time. 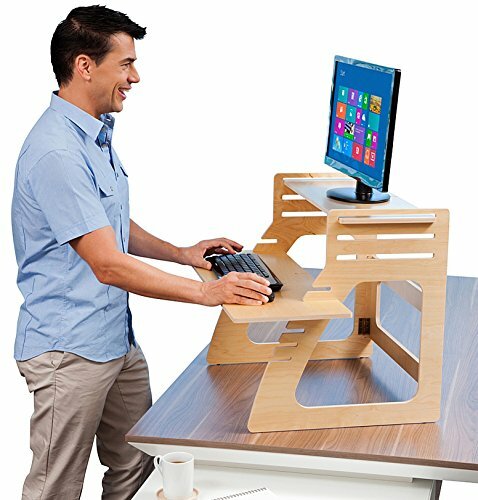 Give your back a rest from slouching in a chair, by converting your workstation into one of the best standing desks within seconds. 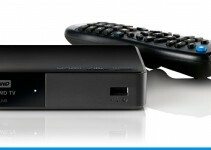 This professional, sleek black design is as attractive as it is convenient. Metal x-brackets slide up and down for effortless adjustment. At just 27 pounds, this lightweight desk can be closed completely for quick transport. A spacious, flat workstation offers plenty of room for all of your essential work accessories. 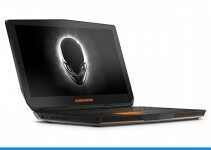 The heavy-duty design can hold a monitor, keyboard and extra laptop. 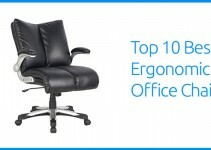 Retailer ErgoRemedies offers a desk with an ergonomic design for precise comfort and positioning between the user and their keyboard/monitor system. The simple, black tiered shelves smoothly adjust to be used while either sitting or standing. A lower shelf holds a keyboard and mouse while the upper shelf holds the monitor. The two-tiered design insures comfortable placement of hands, wrists and head while looking forward. Thick EVA foam strips under the legs keep the desk in place and prevent surface scratching. This cube shaped construction works well for smaller sized desks or minimal office space. The petite yet portable design can hold a laptop or monitor and keyboard. A side shelf is included for the mouse. 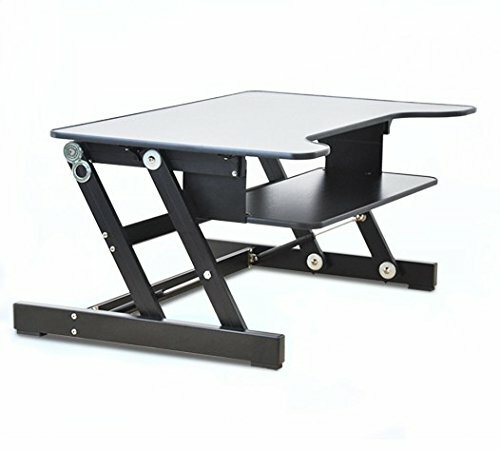 The desk collapses completely to be utilized while sitting and smoothly adjusts to a standing height in seconds. The adjustment legs also act as a brace in the back so that the laptop or monitor will never tip back. The cube shape evenly distributes the weight of the tabletop for added stability. Some assembly is required, but the straightforward construction allows for quick and easy set up. This unique wood standing desk offers ergonomic support in an instant. Different from other black and metal models, this wood desk is a bit more stylish. This is a single monitor shelf, however placed on a larger workstation a laptop can sit next to the desk for use of both. The no-frills construction includes slip-proof slots to position the keyboard shelf where you want it. A 24-inch monitor will sit nicely on the birch plywood top shelf with three adjustable settings. A sturdy wood safety bar in the back will prevent the monitor from tipping. 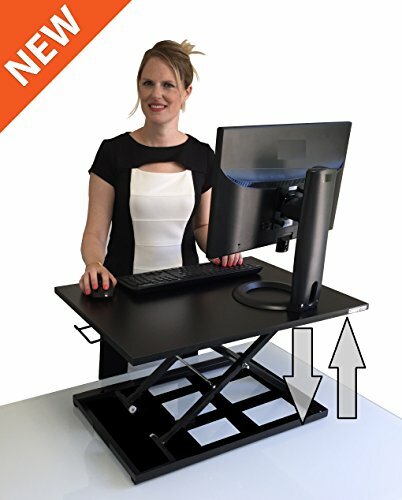 Varidesk manufacturers this standing desk specifically for those using dual monitors. The sturdy base can easily elevate up to 35 pounds. The lower shelf can hold a keyboard and mouse while the upper shelf has room for two monitors or laptops. Their patented spring-loaded device can raise the shelving unit to the required height effortlessly while you transition from sitting to standing. 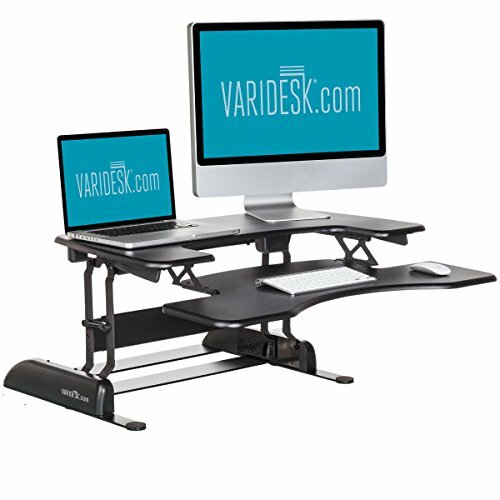 Varidesk has included 11 various height adjustments for the most comfort. The completely assembled modern design will compliment any work space. 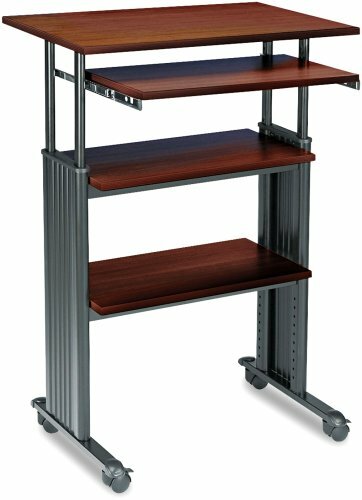 For those who want the health benefits of a standing desk and the convenience of a movable workstation, this cart is the solution. 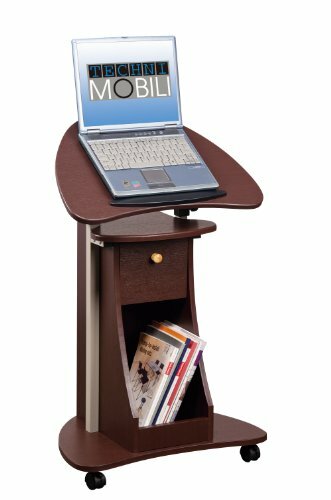 Techni Mobili has created a compact, adjustable ergonomic workstation on wheels, to take your work with you wherever you go. The top shelf smoothly adjusts and locks into place. A lower shelf can hold a keyboard and a mouse. Two shelves are included in this sleek design for storage of books, media equipment or accessories. Nylon castors allow for seamless transport while a wheel -locking feature securely keeps the cart in place. This modern, hole-panel standing desk stands at 42-inches high. While not adjustable, the height of the desk will be ergonomically comfortable for most adults. The solid, steel powder coat finish is stylish yet durable enough for harsher working conditions like in a warehouse. The 38 ½-inch smooth black tabletop has plenty of space for a keyboard, mouse and monitor, along with a few other accessories. A side shelf is included for files or a tablet. Locking castors make is simple to move the work station around and lock into place.